Alpha Sigma Alpha national headquarters staff is vital to advancing the Sorority’s mission and purpose. The national headquarters staff is responsible for the daily operations of the Sorority. The office maintains membership and financial records and provides support and assistance to collegiate and alumnae chapters and members. The staff develops new programs and resources with involvement from volunteer leaders. 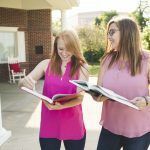 The Alpha Sigma Alpha national headquarters staff exists to provide professional, knowledgeable, efficient and friendly support, guidance and structure to our membership. We are committed to serving enthusiastically our collegiate members, alumnae members and volunteers in a respectful and consistent manner. Please contact Christy Adams, director of collegiate services, with leadership consultant questions. Please contact Krystal Slivinski, executive director, for all other positions.